This past October my hair stylist retired. She had been cutting and coloring my hair for many years. She had been supportive of my decision to grow my hair out from red to silver and I was close to the very end of this process when she left. I was saddened by the loss, but celebrated the new life that she had before her. I came to accept this change and began to explore options for her replacement. Making a long magical story short (beginning with my nail whisperer), I discovered Charlie Price HERE, artist extraordinaire. He felt like the perfect match and since the day that I met him, he has been cutting my hair and expanding my horizons. He started with taking off what remained of the red, and he also recommended that I submit photos to the Donna Baldwin Agency HERE, the premier modeling firm in Denver. He referred me to the photographer Melanie Watson HERE for head shots, and with his encouragement, I decided to give it a try. This past week I was interviewed by the agency and was offered a contract, which I signed. Knock me over with a feather! So off I go on another adventure, which fits with my belief that crones should be represented everywhere! Starting something new is always energizing and exhilarating! I have no idea what the future holds nor do I have expectations, but I have learned to be open to new opportunities that cross my path. In the spirit of “feeling free at 73” AND “old and bold,” with this post I’m entering the contest which is a collaboration between the amazing and groundbreaking blog Man Repeller HERE by Leandra Medine, Bloglovin HERE and H&M HERE #bloglovinhmawards16 HERE. I have no delusions of winning, but that’s not the point. Again, I believe that crones should be everywhere! The amazing vintage couture skirt is by Michaele Vollbracht HERE and I was enthralled with its beauty when visiting my friend Robyn, the proprietress of Wardrobe Works Denver HERE, an elegant consignment store that I have frequented over the years. She kindly and generously offered that I wear the skirt for this post. The pleasure of wearing it for a few hours will be with me always. I don’t have to own every garment that I love, and there’s something grand and sustainable in letting go. Black basic tank – H&M, vintage skirt by Michaele Vollbracht, black heels and bold beaded necklace – Wardrobe Works Denver, black vintage Schiaparelli headpiece, orange glass drop earrings and wide black patent leather belt – estate sales, and black shrug – Florida consignment shop. 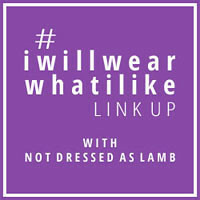 Linking up with Catherine’s #iwillwearwhatilike HERE at Not Dressed As Lamb and Cherie’s Shoe And Tell HERE at Style Nudge. I love you, Judith! I don’t comment, but I always read your work. You are an inspiration to me! I am going to be 60 next month, and will retire from teaching next year. I am full of life and filled with dreams. Your work inspires me to think big, and not limit myself in any way! Thank you for all that you do.